Laws Of Gravity represents a return to form for The Infamous Stringdusters, one of the most successful bands to emerge from bluegrass in recent years and one that is known for its incomparably tight yet improvisation-infused live shows. Over their decade together, they have won three International Bluegrass Music Association awards, earned a “Best Country Instrumental” Grammy nomination in 2011 and garnered widespread critical acclaim. Laws of Gravity was recorded in Nashville with Billy Hume (Ludacris, Ying Yang Twins) in the co-producer’s chair. 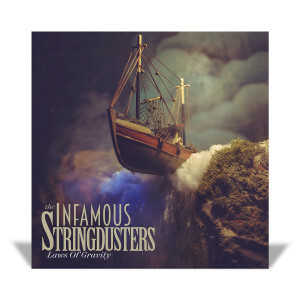 Band members Andy Hall (dobro), Andy Falco(guitar), Chris Pandolfi (banjo), Jeremy Garrett (fiddle), and Travis Book(upright bass) are showcased as writers, singers, and players on an all original set of honest songs with a fresh yet familiar bluegrass/Americana/progressive feel.